MOZART: Concerto No. 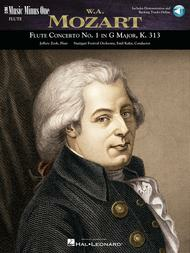 1 in G major, KV313 (KV285c) (Digitally Remastered 2 CD Set) composed by Wolfgang Amadeus Mozart (1756-1791). For flute. Instrumental Solo Part and 2 CDs. Published by Music Minus One (MO.MMOCD3301).ISBN 159615277X.Little need be said about this eternally popular flute concerto, a standard of the repertoire. Here sensitively performed by Jeffery Zook for your reference, then repeated again minus you, the flute soloist!Includes a high-quality printed solo part and a digitally remastered compact disc containing a complete version with soloist, then a second recording of the orchestral accompaniment, minus the soloist; and a second compact disc featuring the complete version again, followed by a -20% slow-tempo accompaniment for practice purposes.